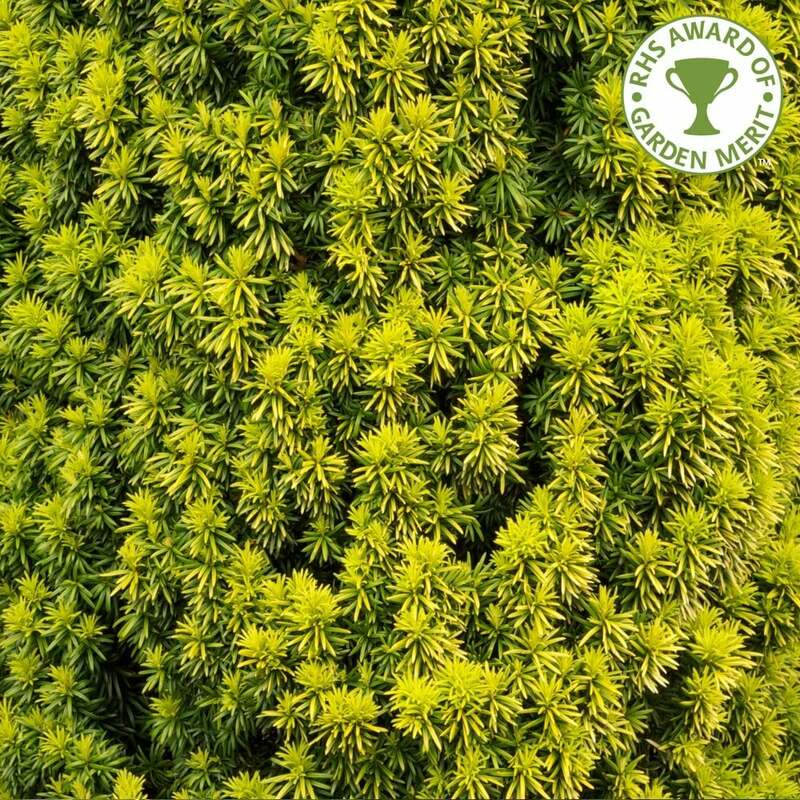 A popular and award-winning dwarf golden Yew tree, perfect for rockeries and patios, Taxus baccata Standishii boasts bright golden yellow foliage. The Standish Yew tree has a dense, upright habit and narrow form. As a very slow growing, dwarf Yew tree, it is the ideal conifer for small gardens. The evergreen foliage is golden yellow year round and decorated with red berries in autumn. The Taxus Standishii tree is suited to a sunny or partially shaded site (foliage will be most vibrant in full sun) and most soil types apart from wet soils. This small conifer has a final height and spread of 1 x 0.5 metre in 20 years somewhat broader than Taxus fastigiata Aureomarginata but it can be clipped to a narrow profile or left to become broadly columnar with age. As with other Yews, it can be hard pruned and will re-generate well from old wood. Note: please bear in mind that all Taxus varieties are toxic if eaten. Our pot grown Standish Irish Yew trees can be planted at any time of the year. Prepare the planting site by removing weeds and grass within a metre of your desired planting hole then dig a hole as deep as the root mass and 2x as wide. We recommend digging a square hole as this encourages the roots to grow straight as opposed to around inside the hole. To help Yew trees establish more effectively, we advise sprinkling rootgrow in the hole. Gently loosen the tree roots and place into the planting hole. Mix 50% of the original soil with 50% high quality compost and use this to fill in the hole. Firm around gently, taking care not to bank the soil up around the collar of the tree. If you’re planting Standish Yew in spring or summer, water well and regularly for the first few months. Keep an eye on young trees and increase watering if there are extended periods of hot or dry weather. If you’re planting in autumn, you may only need to water your tree a little. We offer a range of irrigation kits to assist in watering. Standish Irish Yew trees do not require a lot of pruning. Simply remove any dead, diseased or awkwardly placed branches as and when you see them.